At the Sweet Tree Holdings in Island Pond, workers monitored steam-fired evaporators at an immense modern facility. ISLAND POND, Vt. — Vermont is seeing the dawn of Big Maple. In a high-powered push into New England’s most tradition-bound agriculture, Sweet Tree Holdings — distant subsidiary of a huge Massachusetts-based insurance company — has turned an abandoned furniture factory on the outskirts of this rawboned village into the nation’s largest maple syrup production facility. Some Vermont maple producers fear a monster in the making, a sweet-spewing Frankenstein financed by holding companies and hedge funds that threatens the centuries-old craft of New England syrup making. Sweet Tree Holdings has invested “tens of millions’’ of dollars in the Island Pond operation, said chief executive Michael Argyelan, and is still researching possible products and potential markets — even as its boilers steam full-tilt. Adam Parke, a Christmas tree grower who also makes syrup from 1,800 trees on Windswept Farm in Barton, Vt., is unimpressed. “This is a big corporation intruding on a traditional way of life,’’ said Parke, who is having a good season and expects to bottle more than 500 gallons of top-grade syrup. The transformation in Vermont’s maple sugar industry since the start of the new century has been seismic. What once was an essentially rural sideline — strictly a part-time affair carried out by dairy farmers looking to make extra cash in the slow spring season — is now a fast-expanding, well-financed industry in which the heaviest volumes of syrup are harvested by a fairly small number of fulltime operations with tens of thousands of taps. And loan lines to the banks. But, like some other sugar makers, he is more curious than alarmed. 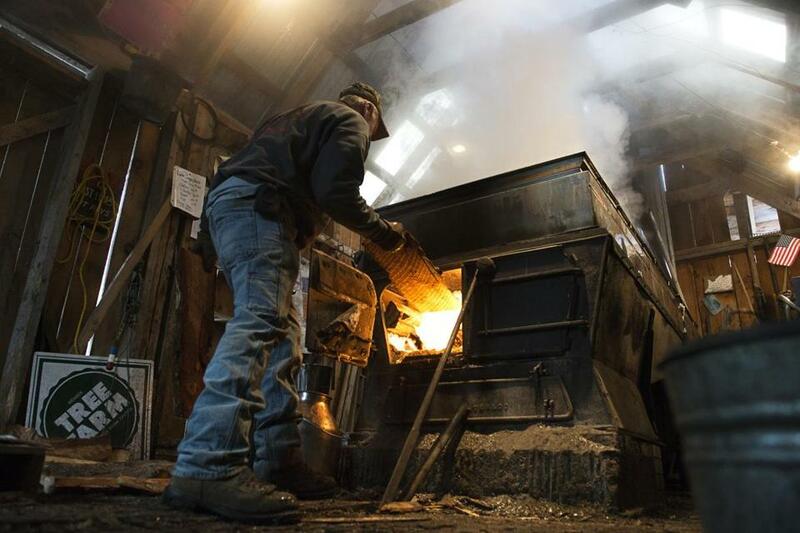 The time-worn process can be found in such places as the Lane Sugarplace in Coventry, where syrup is made using a wood-fired evaporator in a barn. 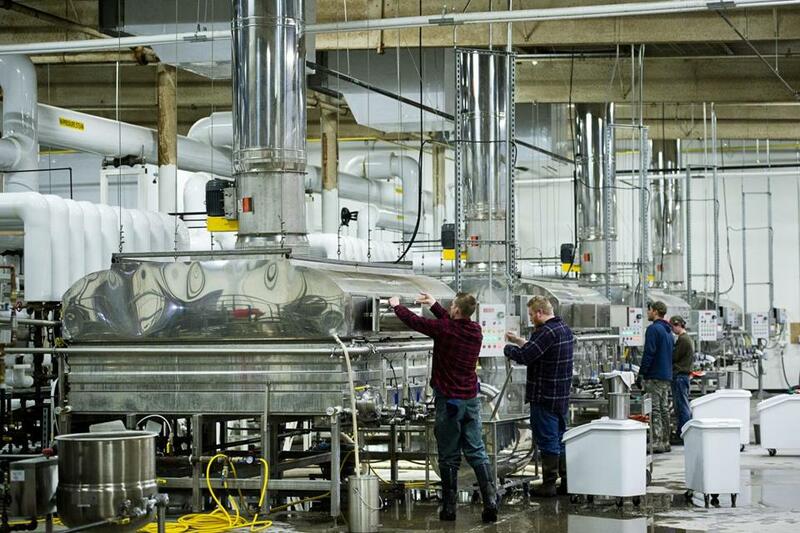 By New England syrup-making standards, Sweet Tree’s operation is boggling in scale. Workers have already tapped 200,000 maples on 26,000 acres of forest purchased or leased in the backlands of Essex Country — these sections, known as “gores,’’ are too thinly inhabited to warrant official designation as towns or villages. They’re home to moose, trackless swamps, and a few hardy survivalists. More than 6,000 miles of vacuum tubing — enough to stretch from frigid Island Pond to sunny San Diego and back — siphon the sap from tree taps to a reverse osmosis plant, where water content is reduced with high-tech equipment. Next it is transported to the gleaming, state-of-the-art sugar factory for boiling in four mammoth, steam-fired evaporators capable of turning out 2,400 gallons of Grade A per hour. By comparison, the average producer in Vermont has 3,451 taps and makes 1,221 gallons per year — and even the state’s mega-producers run to only about 100,000 taps. Sweet Tree Holdings LLC was launched in 2013 by Wood Creek Capital Management, a Connecticut-based hedge fund. Wood Creek, in turn, is a subsidiary of Babson Capital Management, part of the MassMutual Financial Group. The group is an arm of Massachusetts Mutual Life Insurance of Springfield. After a lurching start and weird weather, this season has been good for most producers. “We’ve had some great runs; we’re making beautiful syrup,’’ said Joe Russo, Sweet Tree operations manager and maple “meister,’’ with 51 years of experience running a private sugar operation. “I paid my way through college’’ making syrup, he said. Management is tight-lipped about products. But pancake syrup doesn’t seem to be a huge priority. There’s talk of lightly-sweetened drinking water, flavored syrups, and gourmet maple vinegar. Trade magazines allude to cosmetics, health products, and even maple liquor. The company has promised not to flood the market with bulk syrup, but that prospect remains the worst fear of traditional producers. Foresters reckon one of every four trees in Vermont is a maple, mostly the prime sugar sap-yielding species: sugar and red. Plus, Vermont lies in a narrow climatic strip that reliably hits the critical sweet spot in spring: weeks of frigid nights and warmish days that forestall budding and allow for long sap runs. Vermont made 1.4 million gallons of maple syrup in 2015, or 41 percent of US production. That’s nearly a five-fold increase since the start of the new century. Outsiders are scrambling for an investment opportunity; Sweet Tree isn’t the only out-of-state outfit vying for Green Mountain sugarbush. Meanwhile, Vermont’s own producers are aggressively investing in high-tech equipment to reduce energy costs and shorten the boiling process. 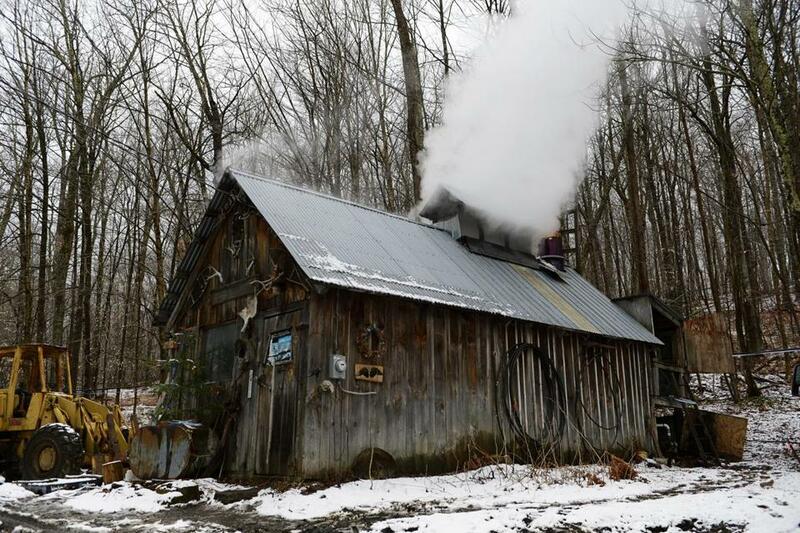 Mike St. Onge fed wood into an evaporator at the Lane Sugarplace in Coventry, Vt.
Vermont maple is carving out market niches all around the world. “We’re exporting to Japan, Australia, Thailand, Europe,’’ said Henry Marckres, maple specialist at the Vermont Agency of Agriculture, Food and Markets. Vermont is the big maple player in the United States, but Canada claims about 74 percent of world markets. So far, there’s been room for everyone. “A lot of stars are in alignment for maple syrup,’’ said Mark L. Isselhardt, maple specialist for the University of Vermont’s Procter Maple Research Center. “It’s natural. It’s seen as healthful. It’s a product associated with tradition and purity. It’s ‘local,’ at least in New England. For all the ruckus stirred by Sweet Tree’s soaring ambitions, the company has yet to sell so much as a spoonful of syrup. The first season was a test run. And the 2016 season is still underway, the sap flowing from the trees and evaporators streaming fresh syrup amid billows of steam. The company declines to provide production figures but appears to already have at least 70,000 gallons of barreled, top-grade syrup stashed in a high-security warehouse. The company has trademarked a brand — Maple Guild – under which it plans to sell an array of products, from classic bottles of pure syrup to “designer’’ waters and teas slightly sweetened with maple. This month Sweet Tree will announce a series of specially flavored maple syrups, such as Madagascar vanilla, cinnamon, and salted caramel. Colin Nickerson can be reached at nickerson.colin@gmail.com.